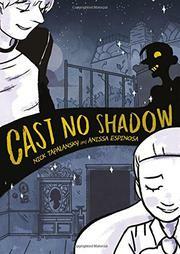 A boy without a shadow falls for a 20th-century ghost girl in this supernatural graphic novel. White, diminutive Greg has been angry and sullen ever since his mom, mayor of their small town, died three years ago. The current mayor’s son is a dark-skinned jock, a “professional buffoon and arrogant jerk extraordinaire,” and Greg is convinced that his dad’s new girlfriend (visually coded as Asian-American) is trying to take the place of his mom. But it’s the summer before 10th grade, and his white, curvy best friend, Layla, is ready for them to get up to some shenanigans at the local rumored-to-be-haunted house. No one has ever seen a ghost there—until shadowless Greg arrives and comes face to face with ghostly Eleanor, a white teenager who’s been dead for decades. They become instantly smitten. But someone—or something—is starting to wreak havoc on the town, and everyone believes it’s Greg. It’s up to Greg, Layla, and Eleanor to put a stop to it. While all questions are ultimately answered, many aspects of the worldbuilding go underexplored, leaving both the character development and the internal logic of the world feeling rushed. Espinosa’s grayscale art (tone is by Eckman-Lawn) has a storyboard softness that is reassuring and appealing. Both the intrusive narrator and adolescent characters are prone to disability insults (“Lame”; “Are you…blind?”), and the haunting gleefully and consciously piles up stale horror tropes, including an “Indian burial ground” (complete with totem pole; Greg points out in frustration that “Indians didn’t even have totem poles in the northeast!”).